They used to say that all roads lead to Rome. But, today, it seems that all roads lead to Russia. Or to its president: Vladimir Putin. Moscow is a key participant in the Syrian war and in the conflict in eastern Ukraine. Russian hackers have been accused of breaking into US servers; the Russian state has been accused of trying to influence the outcome of the US presidential election and of attempting to divide and weaken the European Union. And yet when Vladimir Putin came to power 16 years ago, he appeared ready for a close friendship with the West. The US President Bill Clinton described him as "smart" and a man with "enormous potential". Is Vladimir Putin really trying to break up the EU? But compliments have given way to confrontation, with a list of differences as long as the Russian winter: Syria, Ukraine, Nato enlargement, missile defence. Western governments are disillusioned with an increasingly authoritarian Kremlin leader. And he no longer trusts them. "There's a real feeling now that America is out to prove it is the only superpower," believes veteran broadcaster Vladimir Pozner. "That if Russia does not fall into step the way the US wants it to it's going to have to pay a very high price for that. "The continued expansion of Nato is seen by the Russian leadership, perhaps incorrectly, is seen as being a real threat. You're pushing us, so we're pushing you right back. And we will do whatever we can to make it as unpleasant for you as you've made it for us. "There is a danger of real confrontation, perhaps leading to some kind of military engagement and war." This week the popular Russian tabloid Moskovsky Komsomolets suggested that the Syrian conflict could spark a "direct military confrontation between Russia and America" - on a par with the 1962 Cuban Missile Crisis. It warned of a Third World War. "We had bad relations during the Cold War," says Andrey Kortunov, head of the Russian International Affairs Council, "but during the Cold War the relationship was more or less stable, because we knew what to expect from each other, we knew the rules of the game. "Today we don't have anything like that. So relations aren't stable. This is what makes this relationship dangerous, arguably more dangerous than in the Cold War." The US and other western countries have accused Russia of committing war crimes in Syria with air strikes on civilian and humanitarian targets. Moscow denies it and claims it is attacking terrorists. There may be another objective. "Russian foreign policy is all about the battle for America's respect," explains political commentator Leonid Radzikhovsky. "There's nothing else in our foreign policy. I mean 'respect' in the Russian sense: people respecting you because they are scared of you. "For Putin there is one game in town: first he'll show the Americans the middle finger, then get them to bow down and get them to say 'We want to be your friends'." This week, President Putin suspended an agreement with America to reduce stockpiles of weapons-grade plutonium. In the form of a draft law to parliament he issued an astonishing list of conditions for resuming the deal: the US must scrap all sanctions against Russia and pay Moscow compensation, and America must reduce troops numbers in some Nato countries. It is a sign perhaps of President Putin's frustration that, so far, he has been unable to secure the international respect he believes his country deserves. Would the situation be any different under a different president? "Of course, individuals and personality matter," says political scientist Ekaterina Schulmann. "But keep in mind that the current political elite in Russia is composed of males aged 60+, they are very similar in terms of upbringing, in their psychology, their values, in their education and world view. So replacing one for the other wouldn't change things drastically." Leonid Radzikhovsky is confident that Russia will not go to war with the US. "Putin is a megalomaniac, he is convinced he is 10 times better than any western leader. But he's not the kind of person to open a window on the 18th floor, declare 'I can fly' and jump out. He has no plan to drop a hydrogen bomb on Washington. Narcissism is one thing; suicidal tendencies are another. He is not suicidal." 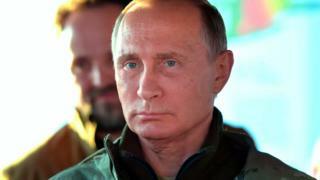 Video Is Vladimir Putin really trying to break up the EU?